For Mexicans and Central Americans trying to cross the border into Texas, getting across the Rio Grande is the easy part. The real killer is 70 miles north of the river, where the Border Patrol operates a permanent checkpoint on Highway 281. To get around it, migrants must walk for days in 100 degree heat. Each years, dozens don’t make it. In many cases when bodies, or bones, are found, they are not identified. Many unidentified migrants are buried in the Sacred Heart Cemetery in Falfurrias. 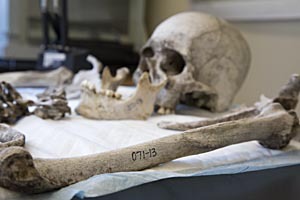 At Baylor University, Dr. Lori Baker and her students are studying the remains, trying to determine their identity. For those who make it alive past the Border Patrol’s internal checkpoint, more hazards remain. On a recent summer morning, a driver packed 26 migrants into a Chevy Astro van. Overloaded and unstable, the van turned over just down the road. Two men, too seriously injured to flee, were taken to a hospital. The others scattered, some recaptured by arriving Border Patrol officers.